Why Malaysiakini Using this Photo? 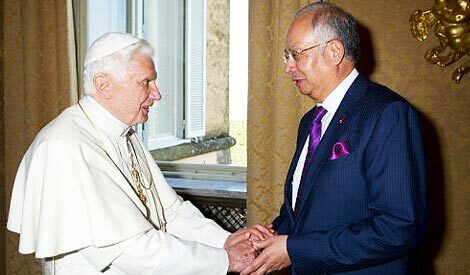 Can Malaysiakini explain this:- This we extracted out from Malaysiakini comments:- by Civic 1.What the heck is wrong with Malaysiakini putting up photo of the Pope with Najib? audie61 says,” what is malaysiakini trying to portray. This is regarding the Pope’s resignation and why and what significance does Najib have to play with a Man of God . It is not right to put religion together with political figures especially so with the RESIGNATION OF THE POPE. Be sensitive when it comes to RELIGION. This will ENRAGE many Catholics. Pope Benedict XVI announced today he will resign as leader of the world’s 1.1 billion Catholics on February 28 because his age prevented him from carrying out his duties – an unprecedented move in the modern history of the Catholic Church. “I have come to the certainty that my strengths, due to an advanced age, are no longer suited to an adequate exercise of the Petrine ministry,” the 85-year-old pope said in a speech pronounced in Latin at a meeting of cardinals in the Vatican. “In order to govern the ship of Saint Peter and proclaim the Gospel, both strength of mind and body are necessary, strength which in the last few months, has deteriorated in me to the extent that I have had to recognise my incapacity to adequately fulfil the ministry entrusted to me,” he said. For this reason, and well aware of the seriousness of this act, with full freedom I declare that I renounce the ministry of Bishop of Rome, Successor of Saint Peter, entrusted to me by the Cardinals on 19 April 2005, in such a way, that as from 28 February 2013, at 20:00 hours, the See of Rome, the See of Saint Peter, will be vacant and a Conclave to elect the new Supreme Pontiff will have to be convoked by those whose competence it is,” he said. Pope Benedict, who has looked increasingly weary in recent months and often has to use a mobile platform to move around St Peter’s basilica during Church services, had hinted in a book of interviews in 2010 that he might resign if he felt he was no longer able to carry out his duties. “The pope caught us a bit by surprise,” Vatican spokesman Federico Lombardi said at a hastily-arranged press conference. The only other pope to resign because he felt unable to fulfil his duties was Celestine V in 1296, a hermit who stepped down after just a few months in office saying he yearned for a simpler life and was not physically capable for the office. Tributes poured in from around the world, with a spokesman for Chancellor Angela Merkel saying the German-born pope deserved “respect” and “gratitude” for his nearly eight years as pontiff. French President Francois Hollande said the pope’s decision was “eminently respectable”. Benedict, formerly Joseph Ratzinger, succeeded the long-reigning and popular John Paul II in April 2005 after serving nearly a quarter-century as the Church’s doctrinal enforcer, earning himself the nickname “God’s Rottweiller”. His papacy has been marked by his efforts to revive the Catholic faith amid rising secularism in the West, as well as the scandals of child abuse by Catholic priests that was hushed-up for decades. Benedict has championed Christianity’s European roots and showed his conservatism by repeatedly stressing family values and fiercely opposing abortion, euthanasia and gay marriage. President of SPDP( Sarawak Progressive Democratic Party) William Mawan says there is no Winnability without Loyalty. June 1st the Dayak communities in Sarawak will be celebrating the Harvest Festival. In a true spirit of multiracial Sarawak all the various races will be joining in this celebrations together. We hope that all of you will reach your destinations safely and enjoy the festive holidays.